Community members replaced a handful of American flags after vandals reportedly tore them down. 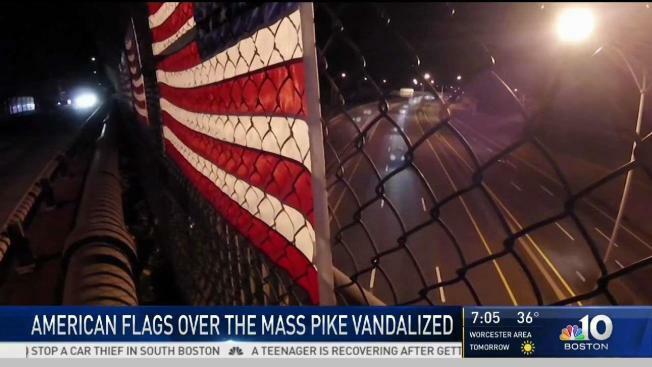 Community members in Newton, Massachusetts replaced a handful of American flags to honor veterans after vandals reportedly tore them down. In three separate incidents in the days leading up to Veterans Day, the flags hanging on the St. James Street Bridge in Newton Corner were cut up, ruined, and stolen. Veterans and volunteers through the local chapter of the American Legion hung new flags in their place, and say they'll continue to do so regardless of how many times they are torn down. “For a person or persons who are doing this -- we don’t know who or how many are doing this -- to actually do this to a bridge that’s dedicated to a veteran is disheartening to all of us that someone in our community would do that," said Richard Spalding, Sr. Vice Commander of the Sons of American Legion Post 440. The Legion also hangs flags on the bridge around Memorial Day, which have never been destroyed.